It's getting chilly out, so winter, comfort food for us: Danish Pounded Beef with Juniper Berries, served with rødkål (Danish red cabbage), mashed potatoes, and lingonberry preserves (from Ikea). My supermarket has two full aisles of just Goya products. You would be surprised at how many non-Hispanic folks are in those two aisles. It is not just an ethnic aisle anymore. The public have discovered it. I wouldn't. Mexican food has been pretty popular throughout the United States for decades now. I know, but seriously, I think it tastes like dirt. I had it in a high-end restaurant on mac 'n cheese. Did not like it. We had leftover New England clam chowder and Spam sandwiches with cheese, romaine and mustard. 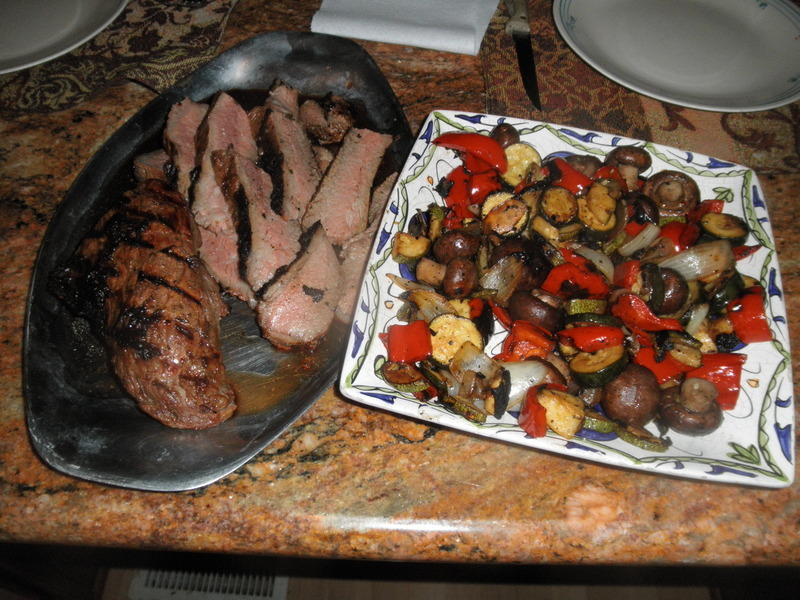 My tri tip got slightly overdone to our taste, but the veggies are always outrageously good. I could eat them every day of the week. Andy, how was your marinated pork tenderloin? ...Andy, how was your marinated pork tenderloin? I liked it. Even more important, SO liked it so it stays in the rotation. So happy to hear Andy. There's nothing that makes a cook happier than a loved one loving the cooking. Thanks Kay. That meal looks fabulous. The tri tip looks like it's still pink. Pink is still tasty and not dry.